Eating flowers is a concept that I am thoroughly fascinated by. It is not that bizarre or uncommon as you might think. Consider this, how many of us eat broccoli or cauliflowers? These common vegetable that we have come to familiarise with are in fact some form of flowers. Lavender has also been traditionally used as flavouring in baking and courgette flowers (which I have written about recently) are commonly stuffed with mozzarella cheese and deed fried in classic Italian cuisine. After a recent visit to Roganic and tasted all the amazing flowers and micro herbs used in their dishes, I am determined to use these intriguing ingredients more in my cooking. There is just one problem, I could never seen to be able to find them in any shop. Although the idea of foraging them myself did occurred to me but I eventually decided against it as that would be a suicidal mission. There are countless varieties of inedible flower which are poisonous and being not an expert in such field, that is definitely not advisable. As for the flowers available at the florist, they are not entirely suitable either as very often they have been sprayed with pesticide. The only viable means for me to get hold of some it seems is to rely on sourcing them in a more conventional way, through farmer's market. And luck was on my side as once again, thanks to the magic of the twittersphere (is there anything they can't do? ), I have discover that the new Cornish Food Club (from the same guys behind Cornish Grill, Adam and Matt ) stall in Maltby Street market stocking just that, organically grown edible flowers and micro herbs. Being not entirely familiar with these, I was rather glad that they have been conveniently picked to compliment the flavours of different meat. 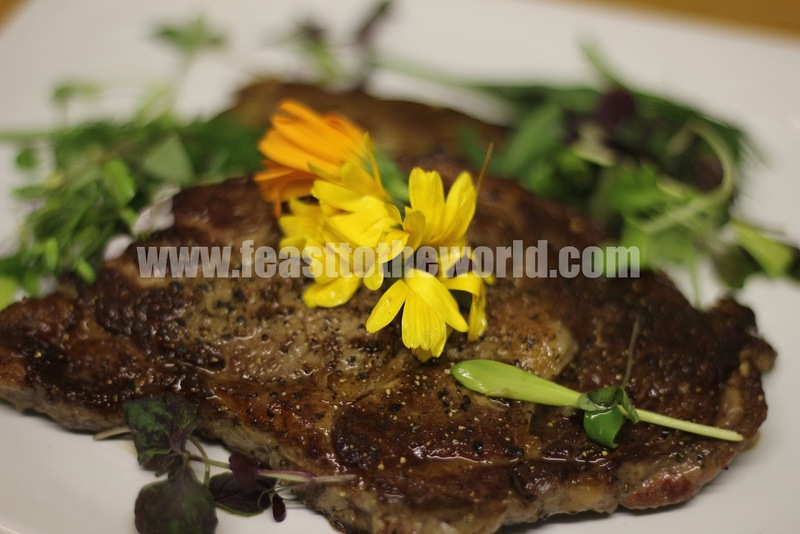 While I was there, I also bought a couple of beautifully well-marbled rib eye steaks from the Cornish Food Club. With all these and a couple of potatoes, I've decided to cook a very simple steak, rösti and salad dish as I didn't want to mess around with the flowers and herbs too much, I wanted to be able to taste them. With such a top notch cuts of steak, all I've done was to pan seared them in a very hot pan with a knob of duck fat. A technique I've learnt from a restaurant in Paris and believe me, this give the steak an additional flavours. 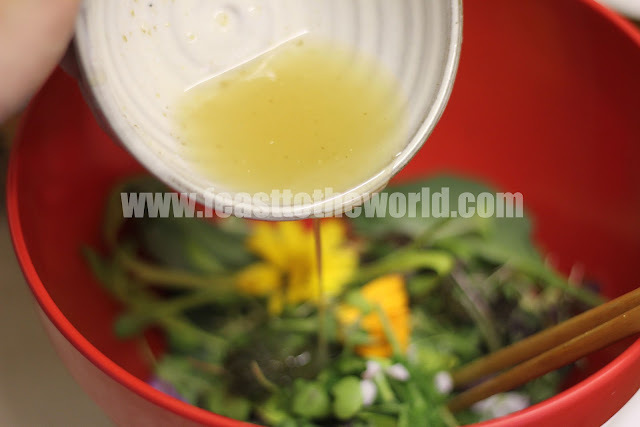 The salad has been very lightly dressed with a Japanese yuzu and honey vinaigrette so it's still nice and light. And the taste test? They were indeed delicious! A great mixture of peppery, zingy and perfumed sensation. Even though it did took me a good hour of tasting each individual leaf and lots of research on Google to identify their name beforehand*, it was all worth it. * There were still a few that I couldn't identify, so if you are familiar with them, do feel free to let me know what they were. For the rösti, coarsely grate the potatoes into a large bowl and season with salt and pepper. Heat the oil and duck fat in a large heavy based pan until sizzling. Add a small potion of the potatoes into the pan and form little flat cakes by flattening them with a spatula. It doesn't matter if they not perfectly round. The strayed bits will be nice and crispy when cooked. Cook for 4-5 minutes, until golden and crisp and turn then over and cook the other side for another 4-5 minutes, until cooked through and golden. Drain on kitchen towel while you continue with the rest until all the potatoes has been used up. Keep warm in a low heat oven while you get on with the steak. Heat the frying pan over high heat, until smoking hot. Lightly brush the steak with olive oil and season well with salt and pepper. Place the steak into the pan and leave to fry for 2 minutes until good searing marks are achieved. Flip the steak, add the duck fat to the pan and fry for another 2 minutes for medium-rare (3 minutes for medium*). Remove and let the steak rest for 1 minute before serving. 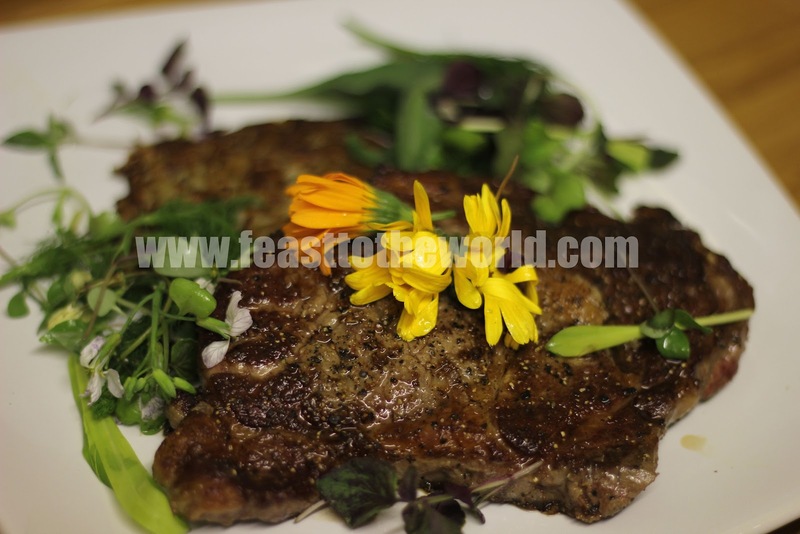 While the steak are resting, prepare the vinaigrette by whisking all the ingredients together in a bowl. 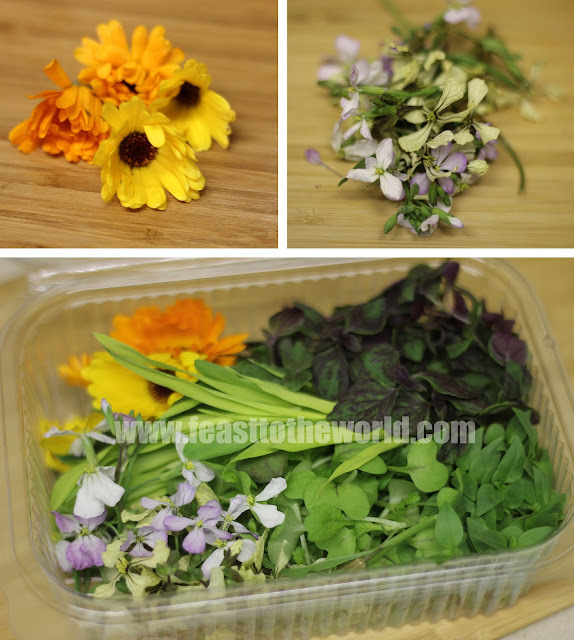 Lightly dressed the salad with the vinaigrette, taking care not to over do it as the flowers and herbs are very delicate. Serve immediately by plating the rösti and the steak first and then sprinkle the salad liberally over this. I'm glad I did, they tasted fantastic!